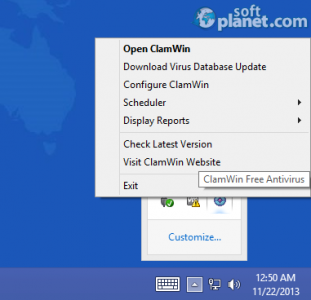 SoftPlanet makes it possible for everyone to get free ClamWin Free Antivirus download directly from our servers. There is no registration needed for downloading. ClamWin Free Antivirus 0.98 is a free antivirus program which can detect any viruses and spyware and remove them very efficiently. You can scan your computers upon schedule and set it up to automatically download the latest virus databases. This application is based on the ClamAV engine and uses the GNU General Public License by the Free Software Foundation. You can use this software absolutely free of charge and it can be installed on any home or work PC without any restrictions. ClamWin Free Antivirus is not like most popular programs in this category, but it is capable of doing the same kind of protection with the same success. It features high detection rates, a scanning scheduler, automatic download of updates, a standalone virus scanner, shell menu integration and more. Email alerts can be sent automatically and various limits can be set in order to speed up the scanning process. 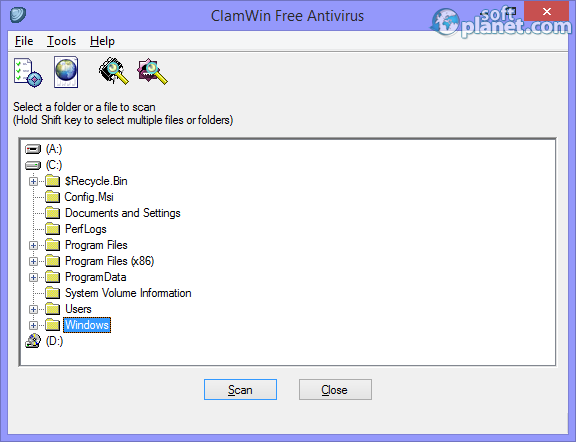 The user interface of ClamWin Free Antivirus looks a bit outdated and if you download and install this program you will see it for yourself. However, this is not the point here, because the main reason that may make you try it is its effectiveness and compatibility with all Windows versions. Seven are the integrated interface languages that users can install in order to use the app in their native language. The main program window has three menus on top and four icons in the toolbar underneath. The icons do not have names, but tooltips are used to describe their functions. A detailed built-in help file explains all product features and even how the program can be used to scan CDs, DVDs and USB flash drives. Users will find eleven tabs in the Preferences window which comprise all program functions that can be changed. In the General tab you can choose what the program will do with the infected files. There are three options available for that: Report only, Remove and Move To Quarantine. The Filters tab has file name patterns that can be included or excluded from scanning and to speed up that process you can also set the Limits tab. Before ClamWin Free Antivirus can be used you have to download the database packages. Once that is done you can use the program at your discretion and at any time. This application is one of the fastest scanners and can scan your entire hard disk drive very quickly and efficiently. Besides scanning the files on the hard drive you can perform a memory scan. All you need to do to activate it is to click on the Scan Memory link from the File menu. 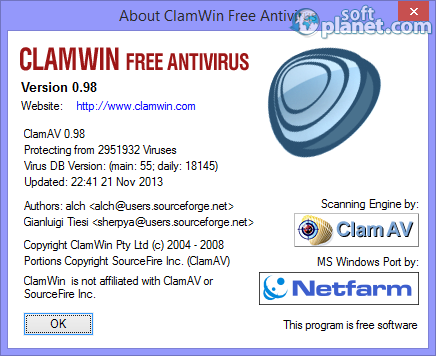 ClamWin Free Antivirus 0.98 is a program which is a perfect solution for older and slower computer configurations. It will not slow down your PC without a reason and you can use it only if you need it. Give it a try and see whether it is the right product for you. You can't lose anything and on top of that the application is free. ClamWin Free Antivirus is VIRUS-FREE! 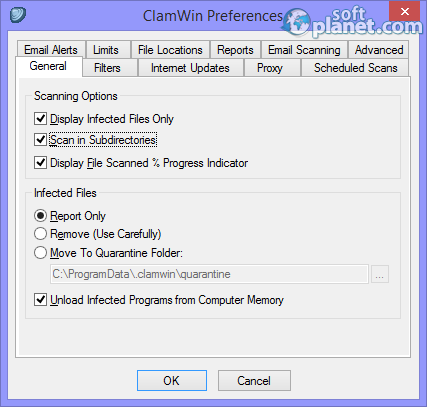 Our security scan shows that ClamWin Free Antivirus is clean from viruses. The current version of ClamWin Free Antivirus has been scanned by our system, which contains 46 different anti-virus algorithms. That ensures that ClamWin Free Antivirus 0.98 is 100% safe for your computer.